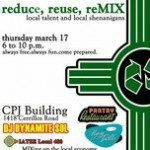 MIX is mashing up with Santa Fe Alliance, IATSE Local 480, Youthworks, Green Means Local and Green Production Resource to fill the CPJ Building with a St. Patrick’s Day master class in remixology. DJ Dynamite Sol will reduce the noise in your brain by reusing beats from his sonic library to reMIX your mind and reboot your booty. The Pantry Restaurant and Flying Tortilla will reduce your hunger by refilling your system with really awesome Cerrillos Corridor grub. Beers (gratis for participants while supplies last) and beverages will revive your lust for life and remind you of why you chose to ride your bike. What do we want from you? Your input on How to Reimagine, Reinvent and Revitalize the Cerrillos Corridor..